I know this will be an unpopular opinion, but I feel like I'd rather see Houston get to the promised land without LeBron. Don't get me wrong; I am all for the Rockets, and have had season tickets to games for multiple years. That said, I am having a hard time seeing the fun in Lebron as a Rocket. In the first place, LeBron is the greatest of his time, and our other stars will dim with him on the team. James H. will be a shell of himself (he needs to be #1 or he withdraws as a player), and Paul will turn into a two-guard. Its clear that Paul's first step has lost its bite, and I can see him giving up the rock in favor of LeBron as Paul's skills continue to decline. Moreover, with a depleted bench (Rox can't afford more), Houston ball will become iso-ball for sure. That's just not fun basketball to me. And I am not sure its a championship team either, to be honest, without Ego, Capela, Trevor, PJ (all of whom would almost certainly be lost if LeBron came here in a trade). If he does come, it will be as if LeBron feels nothing for Houston, and is only coming here to get a ring. Scottie Pippen and Charles Barkley all over again? No thank you. That experiment didn't work, and this one might not either! And even if we were successful, LeBron to Houston would be further proof that parity is dead in the NBA. Another year of four great teams in a 30 team league? No thanks..
More than anything though..its just weird to all of a sudden root for a guy you have spent so much time rooting against. Feels like we are selling out. Not sure the championship would feel the same. mickey_angelo, kwakmeister, mockster and 7 others like this. I want the Rockets to win, no matter what it takes. saleem, majicdonjuan, Deuce and 26 others like this. I think almost every poster in here would rather take the W without Lebron as compared to with him. I just don't see that happening with CP3 a year older. If they can upgrade the team in FA without Lebron then that would be my number one option as well. Rocket River, RocketsFan247, lw17 and 4 others like this. If we can add Lebron we add Lebron bottom line. DonKnock, D-rock, Tfor3 and 1 other person like this. If we get LeBron, then we become the new Golden State. Is that really what everybody wants?? Seriously?? I'd personally get no joy out of watching an unfairly stacked team destroy the rest of the league. PhilCollins, D-rock, 1Deep and 1 other person like this. That's what I am saying. I just don't see the enjoyment in beating Orlando by 23 one night. Milwaukee by 17 the next. Chicago by 16 the next.. and so on... Why watch when the outcome is certain. The ironic thing is we'd have 2 stars that are soon 34.......and I do not think that is a guarantee for anything. Yes, we would become a 68 win team potentially but I think guys are still gassed in the playoffs. And I dun even know who we got as role players. I just do not think D'Antoni is that guy, you have to be Pop great. He manages to run certain guys to the ground. Everything looks so good on paper, always. The Warriors are not a normal team. As great as Harden is. As great as Paul was when he turned it on to win game 5/6 against the Warriors. It was enough. The margin for error is razor thin against a team like that. Harden has lost 3 of the last 4 seasons to the Warriors, I’ll throw up on my TV if it happens a 4th or hell 5th time. By the way Lebron has lost to them 3 of the last 4 seasons also. Again they are not a normal team. Under normal circumstances the Rockets would have won this year most likely. Under those circumstances it may not be ideal to get Lebron, but it is what it is. Even with Lebron/Harden/Paul they will have to play damn good to win. I can be happy and content with that. Rocket River, lw17, Richie_Rich and 1 other person like this. Saying no to LeBron is like saying no to a championship. This isn’t your dad’s NBA, this is an all out arms race. Your either a team with a stockpile or a team digging a bomb shelter waiting for years for the dust to settle and clouds to clear, just praying for ping pong balls to bounce your way into relevancy. majicdonjuan, wesbound, Richie_Rich and 2 others like this. majicdonjuan, Deuce, jamisonrocket and 2 others like this. The ping pong balls fell into OKC's lap, they just did not know how to keep the pieces together. Such a small market, so many talents. Man, this is some stupid ****. dreamshakin, DonKnock and roslolian like this. 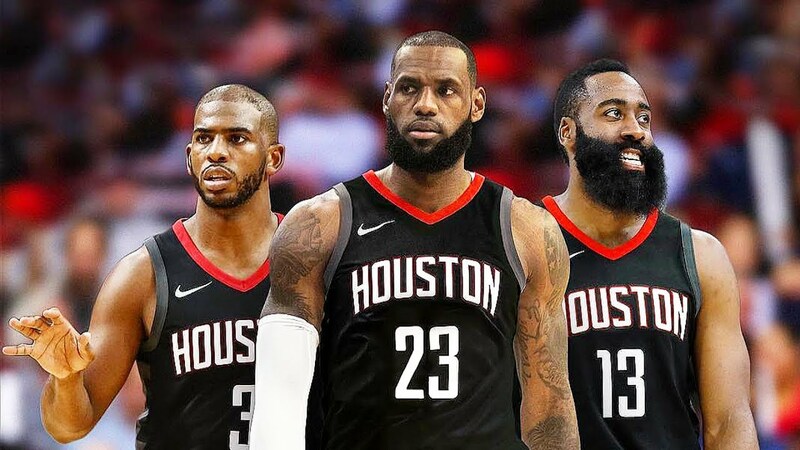 I know this will be an unpopular opinion, but I feel like I'd rather see Houston get to the promised land without LeBron. How is it unpopular if there have already been a bunch of threads on just that same idea? Have fun on the sidelines. Golden State has 4 all stars and a former all star leading their bench. How does adding Lebron make Houston the "New Golden State" when their 3 all stars are par for the course? Your last sentence makes no sense, how many tears did GSW fans cry because they have the best team in the league? LOL WTF you want your team to be weak but somehow win a ring? How does that work? Rocket River and D-rock like this. I totally get that. The league should have parity. All season long, really the only question of this past season was "Can the Rockets compete and possibly have a chance to best the Warriors?" We came so close. But we didn't quite. Besides that the outcome of the entire season was never in doubt. Ever since the big 3 in Boston, and then the Heatles and now GSW and beta KD, the league has been becoming about superteams, and not only that but one superteam one-upping the last one. Is it right? Is it exciting? Is it unfair? Is it boring to know the outcome of the season before the games are even played? Those aren't questions for me. I just want the Rockets to win a championship. I'm not really that big of a fan of LeBron and his diva attitude, taking franchises hostage to do what he wants and all that... But as long as GSW and beta-Durant are in the league we have to respond in the same way. peleincubus, wesbound, francis 4 prez and 1 other person like this. You made some good points arguing for the teams soul. I'm in the win at all costs mode, so it's interesting to see a different perspective. I actually don't mind selling out for a year. We're in year 7 or 8 after Bron made Super teams a thing in the league, so it's the New Normal now. From a personal standpoint, it isn't like I'm selling out for a million dollars because it all resets the year after. A bigger consequence to The Decision 3.0 is how many contacts are we going to pick up that will kill cap space and flexibility the year after this one? Our window is very tight without draft picks for another Capela to develop. Fertita can pay for late picks but that's curing the symptom to a deeper problem. It's simple man: You're all about #Pursuit and the rest of us are all about #Championships. Are you annoyed with the Astros? No, b/c it's an arms race. If we didn't get all those top picks in reward for years of sucking could we compete with $250mm payrolls our of NY, CHI, and LA (an LA team is in our division for goodness sake). Could we compete with the $100mm cost for Cuban PROSPECTS - not Yuli, a legend in Cuba - but freggin prospects? And yeah signing LBJ isn't equivalent to grooming in-house talent, but it avoids the tanking debate all-together. Certainly a bridge worth displacing via free-agency IMO. Idealism has its place - but sports jumped that shark looooong ago. Get with it Breh's. We had a shot to win without Lebron. We didn't. We were a hamstring short. Here's the thing about CP. He is the best PG to ever play the game - WHEN HEALTHY. That asterisk is always going to cloud his legacy. His body gives out on him at the worst times. Nobody questions his IQ, his skill, his desire. We need more talent than to just "run it back." Lebron would be great - despite the noise surrounding his arrival. While I agree that winning without him would be preferable, it's risky to just run it back, as our PG continues to age.